One of my favorite treat in the whole wide world! One that reminds me of summers in France :) of my dear French friends. So few, everyday, simple ingredients and such an amazing result! 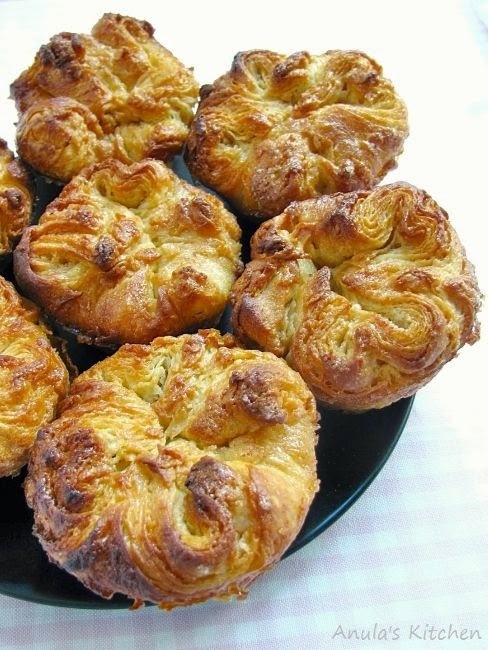 Kouign-amann is an essence of Brittany for me (aside from salted caramel and galettes of course). How I missed that taste! 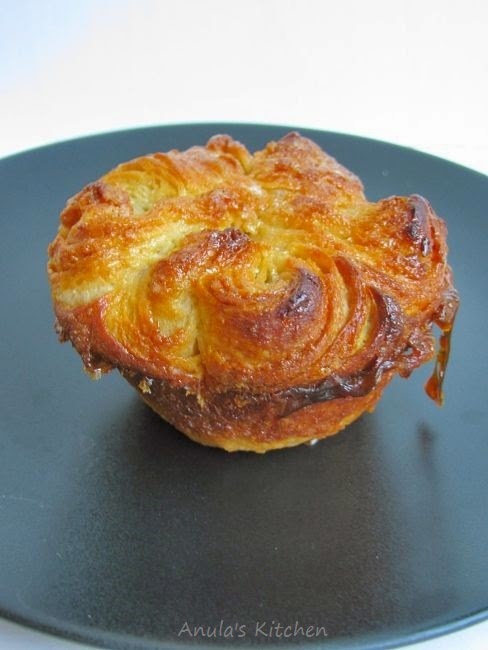 It's really hard to describe kouign-amann. Breadish, sweet and sticky, "caramely", crunchy outside and soft, almost velvety inside. I love it slightly warmed, so the caramel becomes soft, paired with a side of cream or vanilla ice-cream (but I will happily eat it plain, as it is, with just a cup of strong, black coffee to keep it company). I will not lie to you - it IS tricky to make, even though all the steps of the whole process aren't that difficult. It was quite daunting when I read the recipe (and please, DO read it from start to finish before you start doing anything!) but I didn't give up and... I'm so glad I was daring enough to make it :) The recipe and instructions call for pastry rings, in which you're supposed to bake your kouign-ammans, but as I didn't have them I simply used... muffin/cupcake baking tray. Which thankfully worked well! The below recipe comes from a great book "The Baking Bible" by Rose Bernabaum - and I do admit, that I haven't heard about her much, before I came across her newest cook book. I like Rose's writing style, which is clear and simply, explaining everything with the smallest detail. It reminds me a little of Julia Child and her writing. I'm putting the recipe here exactly as it is in the book - because of the complexity/many steps of the whole process and the fact that I really want you to try it and succeed! The dough takes about 6 hours from start to finish, including baking. The actual hands-on time is very short, because the dough does most of the work, but it is necessary to follow the time schedule strictly. In the bowl of a stand mixer, with a hand whisk, mix together the flour, yeast, and then the salt. Add the water and the melted butter. Attach the dough hook and, starting on low speed, mix until the flour mixture is moistened, scraping down the sides of the bowl as necessary. Continuing on low speed, beat for 4 minutes. The dough will be silky smooth and have cleaned the sides of the bowl, but it will stick to the bottom and be very soft and slightly sticky to the touch. Cover the bowl and let it rest at room temperature for 30 minutes. Meanwhile, prepare the butter square. Place the softened butter on a large sheet of plastic wrap and wrap it loosely. If the butter is cold, pound it lightly with a rolling pin to flatten and soften it. Then knead it together using the plastic wrap and your knuckles to avoid touching the butter directly. Shape the butter into a 5 inch square (it will be about ¾ inch high). At this point, the butter should be firm but workable—68° to 70°F/20° to 21°C. Use it at once or set it in a cool area. The butter should be the same consistency as the dough when they are rolled together or it will break through the dough and not distribute evenly. Roll out the dough on a well-floured surface to an 8 inch square. Place the plastic wrapped butter square diagonally in the center of the dough square and lightly mark the dough at the edges of the butter with the dull side of a clean ruler or a knife. Remove the butter and roll each marked corner of the dough into a flap. The dough will be slightly elastic. Unwrap and place the butter on the dough. Wrap the butter by stretching the flaps slightly to reach across the butter square. Brush off any flour on the first three flaps before stretching over the fourth flap to wrap the butter square securely. It will form a 5¾ inch square dough package. Pinch together the seams to seal it well. Before each turn, move the dough so that the closed end is facing to the left. Repeat the same process of rolling and folding as for the first turn, but every once in a while, flip over the dough to keep the seams aligned. (The upper part tends to roll more than the bottom.) Cover the dough with plastic wrap and refrigerate for another hour. Clean the work surface and sprinkle with about half of the sugar in a rectangle the width of the dough. Set the dough on top and sprinkle most of the remaining sugar on top of it. Roll the dough again into a 14 by 8 inch rectangle, flipping it over from time to time. Scrape sugar from the work surface and sprinkle it and some of the remaining sugar on top of the dough until all but 2 to 3 tablespoons of the sugar have been rolled into the dough. With a bench scraper, form the dough into an even rectangle. Fold the dough into thirds, wrap it with plastic wrap, and freeze for 30 minutes. Then refrigerate it for 30 minutes. Spread the remaining sugar on the work surface in a rectangle, which will be used for rolling the dough and shaping. Set the pastry rings on the prepared sheet pan and lightly coat the insides and bottom with nonstick cooking spray. Set the dough on top of the sugar on the work surface. Roll it from the center to the edges, then as necessary to form a 16 by 8 inch rectangle. It will be about ⅜ inch thick. Cut the dough into 8 equal pieces. Each will be about a 4 inch square (average weight should be 4.9 ounces/140 grams). The dough will now be somewhat sticky as the sugar becomes syrupy. Roll 1 of the squares into a 5½ to 6 inch square. Bring up the four corners to the center and press down firmly over the top of the dough. Cup the dough square into the palm of your hand to support it and keep the four corners together. Repeat folding, bringing up the corners to the center a second time. This will be more difficult because the dough is now thicker, but simply press it down in the center (if necessary, dip your fingertip in sugar) and push it together as well as possible. Set the dough in a prepared pastry ring on the sheet pan. Repeat with the other dough squares. Each one will open up slightly and take its own shape, which is part of its charm. Preheat the oven thirty minutes or longer before baking, set an oven rack at the lowest level. Preheat the oven to 400°F/200°C. Bake the Kouigns Bake for 12 minutes. For even baking, rotate the pan halfway around. 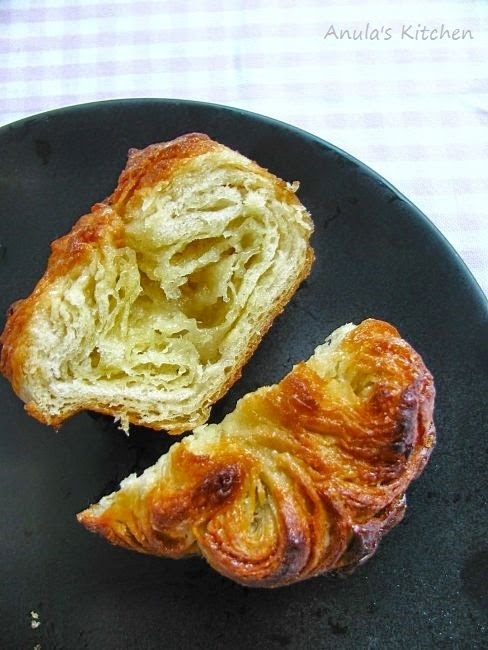 Continue baking for 8 to 15 minutes, or until the pastries are the pastry rings and a pancake turner to lift each kouign onto another wire rack that has been lightly coated with nonstick cooking spray and set over paper towels to catch any leaking butter. (About 2 tablespoons of butter will have leaked from the kouigns onto the aluminum foil.) If any of the kouigns cannot be removed from the rings, return them to the oven for a few minutes to soften the caramel. Let the kouigns cool for about 10 minutes. The texture is softest and the kouigns most delicious when eaten just baked and while still warm. Store In a paper bag: room temperature, 2 days. To reheat: 8 to 10 seconds in a microwave or 3 to 5 minutes in a preheated 350°F/175°C oven. As mentioned already I sued 12 muffin baking tray so I cut my dough into 12 equal squares, slightly smaller than in the original recipe.